Love Never Dies Beach Lovers Skeleton Figurine Wedding Cake Topper [7523S] - $17.99 : Mystic Crypt, the most unique, hard to find items at ghoulishly great prices! 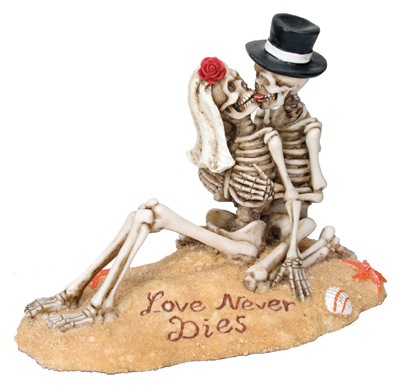 Love Never Dies Beach Lovers Skeleton Figurine Wedding Cake Topper. This bold and dramatic Gothic skeleton bride and groom will make a striking statement on your wedding cake- especially for a beach wedding or destination wedding. They are delicately hand painted with Love Never Dies written in the sand. Perfect for any fantasy or Gothic themed wedding! 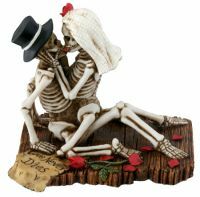 Perfect wedding cake topper for gothic weddings. 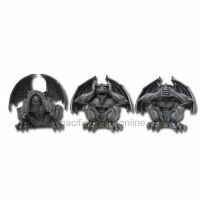 H: 4 1/4 inches , Length: 5 1/2 inches, is meticulously crafted from cold cast resin and hand painted.